Out of all the sneaky expenses that tend to pop up often and bust your budget, entertainment is one of the most popular ones. Spending on fun outings and experience is common, but it can easily get out of hand when you go to one too many happy hours or see an expensive sporting event with friends. Limiting your entertainment is not the answer because it can just backfire making you feel deprived not to mention bored. The solution is to create a realistic ‘fun budget’ that also allows you to meet your other financial goals. That said, adopting frugal and fun ways to entertain yourself will help you stick to that budget and still enjoy your life. Here are seven ideas for budget-friendly things you can do for fun. If there are any free museums or zoos in your area, be sure to check them out. You can pack a lunch and have a bus fun-filled day and spend practically nothing. If you can’t get out on a free museum day, be sure to look for reduced admission days. Some museums might offer discounts to in-state residents on certain days of the year so you can plan your visit around that time to save. Check with the library, park district, or visitor’s website for your city to search for local events year-round. I do this all the time and it’s great to be on of the first to hear about free and affordable events and festivals that might interest you. You may find free comedy shows, art showings, local plays, etc. National and state parks are often free or very affordable to get into. You can plan a day of hiking and exploring and also get some great exercise in too or even make a weekend out of it and camp out. The library is the ultimate resource free entertainment. Not only can you rent books and movies for free, but you can also attend events and join clubs to stay busy. Libraries tend to have activities that will appeal to all ages from younger kids and teens to adult programs and activities. If you don’t happen to see anything you like at your local library, you can pitch them on an idea that might appeal to you and others in the community. 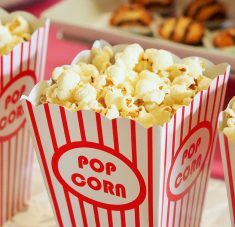 The cheapest way to see a movie is probably in the comfort of your own home but if you wish to turn it into an outing, consider going to the first showing of the day at the theatre. This is commonly referred to as the matinee and it’s usually always the cheapest showing. If you can’t make it to the matinee, see if the theatre offers cheaper prices before evening times. For example, the theatre may charge more for tickets after 6 pm so if you see a movie before then, you can pay less. Also, don’t forget about reward programs. If your movie theatre offers one, sign up so you can receive discounts and freebies. You can see a movie for as little as five dollars on Sundays and Tuesdays at my local theatre using their app. Interested in seeing a game? You can keep your outing frugal when you choose to watch a local high school or college team play instead of the city’s professional team. Often times, entertainment means dining out socially with friends and there’s nothing wrong with that. Unfortunately, the cost can increase pretty quickly. To keep the expense under control, look for restaurant specials and promotions and don’t be afraid to use coupons as well. For example, you may be able to go watch the game with a friend during happy hour at the bar and grill where drinks and appetizers are ½ off. If there’s a special discount night or ‘kids eat free’ hours, you can save big there as well. Savings on entertainment are literally everywhere is you just look and plan carefully. Don’t forget to use sites like Groupon and LivingSocial to save money on local outings and experiences. Just because you’re on a budget, doesn’t mean you shouldn’t have fun.